Chet Wiener writes poetry in English and French. He is the author of a book of poems in French, Devant l’abondance (P.O.L) and the chapbook WalkDontWalk (Potes and Poets). He has translated Félix Guattari and Pierre Alferi, among others into English, co-edited, with Stacy Doris, the collection of translations: Christophe Tarkos; Ma Langue est Poétique (Roof Books), and his poems, translations and essays on translation appear in publications in the United States and France. He lives in San Francisco. 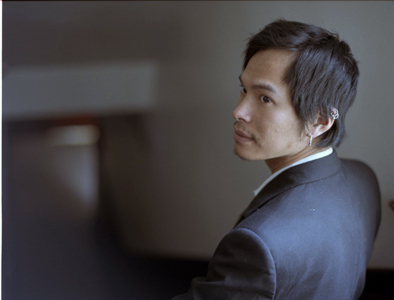 Originally from Strasbourg, France, françois luong currently lives in San Francisco. Poems and translations can be found or are forthcoming in Aufgabe, Verse, LIT, West Wind Review, Dandelion, Mantis, and elsewhere. In 2010, he edited a segment of “Eleven Poets from Québec” for New American Writing. He has also translated the work of Esther Tellermann, François Turcot, and Rémi Froger. Patrick Durgin wrote a published PQRS earlier this year and is also coauthor of The Route (Atelos, 2008, with Jen Hofer). He has published numerous chapbooks, including Imitation Poems (2006) and Color Music (2002). Durgin is also editor of Hannah Weiner's Open House and The Early and Clairvoyant Journals of Hannah Weiner. He teaches critical theory, literature, and writing at the School of the Art Institute of Chicago. Melanie Noel is the author of The Monarchs (Stockport Flats, 2013). Her work has appeared in Weekday, LVNG, La Norda Especialo and THE ARCADIA PROJECT. She's also written poems for short films and installations, and co-curated APOSTROPHE, a dance, music, and poetry series. She now curates Impala, a reading series that takes place in her grandmother's car. Don Mee Choi is the author of The Morning News is Exciting (Action Books, 2010), and the recipient of a 2011 Whiting Writers’ Award. She is also a translator of contemporary Korean writing including, most recently Kim Hyesoon’s Princess Abandoned (Tinfish, 2012) and All the Garbage of the World Unite! (Action Books, 2011), winner of the 2012 Lucien Stryk Asian Translation Prize. In 1980, I was still living with my family in Hong Kong. In May of that year, my father filmed numerous anti-dictatorship demonstrations in Seoul, South Korea and the triumphant beginning of the pro-democratic uprising led by students and civilians in the city of Kwangju. Just before the Kwangju massacre in which about 2000 were killed by South Korean troops, all foreign news staff were given an order to leave the country. My father safely returned to Hong Kong. My brother was still in Seoul, caught up in the wave of nation-wide demonstrations. After what he had seen that year and the massacre that took place in Kwangju, my father thought that we could never return to South Korea, that the military rule would never end. We all had to go somewhere and find a place to live. My father’s job allowed him to relocate with my mother and younger brother to Frankfurt, Germany. My older brother was able to leave South Korea and landed in Australia. My sister stayed in Hong Kong to finish her studies, then left for Australia. I was actually the first one to depart from Hong Kong in order to find a “place”—a year after the Kwangju uprising. The place I landed was Los Angeles. At CalArts, I began working with super8 and 16mm films shortly after producing some series of sculptures/installations. I was most moved by Straub’s and Huillet’s film, History Lessons (1972). I was struck not only by the powerful dissonance of image and sound, but also how the film so effectively disrupted conventional cinematic expectations, especially setting—a sense of place. I wanted to show in my films how dissonant my new external surroundings were to my internal ones—the places I had left behind in South Korea and Hong Kong. For me, a place was and still is not seamless. I wanted to convey in my films a sense of disorientation, dislocation, and placelessness. The California Film 1985 was shot entirely hand held, and my artist friend, Claudia Ryan, kindly agreed to be in it. Melanie Noel, my poet friend, will be projecting the film with a hand-held projector onto various unconventional, transitory surfaces.